(Moscow Times – themoscowtimes.com – June 7, 2013) Lyudmila Putina once called President Vladimir Putin a vampire, while he in turn has suggested that anyone who could put up with her for three weeks was heroic and deserved a monument. The book is titled “Fragile Friendships” and was penned by a German friend, Irene Pietsch, the wife of a Hamburg banker, who became acquainted with the Putins in 1995. “Unfortunately, he is a vampire,” Lyumila Putina said jokingly of her husband, according to the German-language book. Pietsch said Putina thought highly of truthfulness, but was reprimanded by her husband: “Who cares about your truths.” Then Vladimir Putin told Pietsch that she would deserve a monument if she could bear to spend three weeks with Lyudmila. “This awful isolation. No more traveling wherever we want to go; no longer able to say whatever we want. I had only just begun to live,” she said. The two women met in 1995 when Vladimir Putin was deputy mayor of St. Petersburg and his family was visiting Hamburg, which has a sister-city relationship with Russia’s northern capital. The future president’s family had all learned German while he was a KGB agent stationed in the East German city of Dresden in the 1980s. 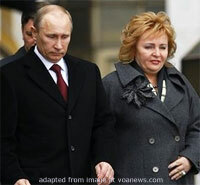 Pietsch said Lyudmila Putin described her husband as just the right man for her ­ he didn’t drink and he didn’t beat her. However, she fretted about him spending too much time with his friends in the evenings ­ social gatherings at which she had to serve drinks, gherkins and fish, Pietsch wrote. Lyudmila also complained about German men rousing their wives early every morning to prepare their husbands’ breakfasts because her Volodya started making similar demands after visiting Germany. When Putin started working as deputy to then-Kremlin property manager Pavel Borodin, the women indulged in an intense correspondence by fax from Putin’s Kremlin office. In 1997, Pietsch and her husband visited the Putins for a week. They stayed at a government dacha in Arkhangelskoye, where Lyudmila cooked soups and Vladimir Putin, wearing a pullover, exuded charm. Pietsch described his blue-green eyes as “two hungry, lurking predators” that he used as weapons. On that particular visit, Putin declared himself in favor of a Russian version of Germany’s social democracy, she said. Lyudmila traveled to Hamburg in 1997 for four days and spent most of her time shopping. Pietsch said Lyudmila was angry that her husband, apparently aware of the uproar over credit cards allegedly issued to the Boris Yeltsin family, had not given her a credit card. “I will never be like Raisa Gorbachev,” Lyudmila said. Editor’s note: A version of this story appeared in The Moscow Times on Feb. 23, 2001.